Fremont, California, USA, April 21, 2010 - Patriot Memory, a global pioneer in high-performance memory, NAND flash and computer technology , today announced it’s new family of SuperSpeed USB products as a part of its peripheral product line. 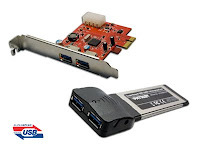 Available immediately are the first two Patriot products offering USB 3.0: the PCUSB3PCIE and PCUSB3EXP adapter cards. The PCUSB3PCIE is an adapter card for desktop PCs that adds two SuperSpeed USB ports and fast data transfers of up to 5Gbps data throughput. The PCUSB3EXP brings the same speed and USB 3.0 connectivity to notebook computers using the ExpressCard connection found on recent generation notebooks. Additionally, Patriot will soon offer a SuperSpeed USB 2.5” enclosure, Gauntlet, for notebook Hard Disk Drives (HDD) or Solid State Drives (SSD). With a durable all aluminum design, quality craftsmanship and fast data transfer speeds provided by the USB 3.0 interface, Gauntlet is the perfect solution for portable storage: support for large capacity drives and blazing fast transfer speeds that make media sharing fast and easy. SuperSpeed USB 3.0 supports up to 5Gb/s bandwidth, ten times faster than USB 2.0. These adapters support the full USB 3.0 functionality as well as being fully backwards compatible with USB 2.0 devices. Both the PCUSB3PCIE and PCUSB3EXP are designed with supplemental power input jacks to support power hungry USB 3.0 products. Both adapters are immediately available through your favorite Patriot supplier. Patriot Memory designs, manufactures and markets high performance, enthusiast memory modules, flash products, and computing technologies. Patriot products have become world renown for their extreme performance, reliability and innovation. Patriot Memory sells its products through original equipment manufacturers , retailers, e-tailers and distributors throughout the world with operations in North America, Asia and Europe. Patriot Memory’s parent company, PDP Systems, Inc., was founded in 1985 and is headquartered in Fremont, California, USA.